Christmas Eve was a unique experience. The roomies and I got to hang out with some people that we have met, drinking wine, eating beef, and watching fireworks go off from the rooftop terrace. Not like any Christmas I have experienced before. After some eats and treats, our hosts decided to give out some presents. We didn’t expect gifts this Christmas. We were taken aback and humbled by the gesture. We tore open the wrapping and found a guide to Argentina. However, it wasn’t just any guide. Upon reading the contents within, we were shocked and humored at this compilation of hilarious, and sometimes crude, colloquialisms used by porteños. It begins with a disclaimer to use the book wisely. Although Argentines are known for some pretty vulgar slang, the guide warns to use the language only amidst friends and open-minded family. 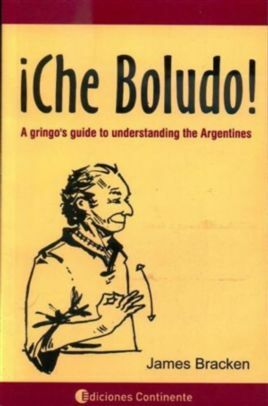 Essentially, is is a dictionary that starts with abollado (literally meaning dented, but in Argentina it means someone who appears to be in rough shape), all the way to zoquete (which literally means short socks; porteños use the word to mean “idiot” or “fool”), and everything in between. Apparently, the word for “fart,” pedo, is really common here. For example, “en pedo” is translated as “in farted,” but really means “to be drunk.” The saying, “vivir en nubo de pedos” (to live in a cloud of farts), means to be out of touch with reality. However, some of the content is quite shocking. Some of the words used for genitalia or profanities are words that one could accidentally use everyday. Be careful what context you use words like palo (stick) or concha (shell). Sometimes they mean something entirely different. There are also double meanings that may seem bizarre at first. Transar can mean two things: to french kiss or to make an illegal deal or agreement. Is there a common root there? In the back of the book are common phrases that an Argentine could use. When someone says, “me pica el bagre” — catfish is nibbling at me — it doesn´t mean anything crude, instead it means, “I´m hungry.” If someone does “mandar fruta” — send fruit — he or she is actually lying or talking crap. If someone eats a little bone — comerse un huesito — he is talking about how he slept with a beautiful women. There are more quips and phrases that I don´t have space nor the nerve to write. However, a highly recommended read, even if you don´t travel to Argentina but want to know the idiosyncrasies of the language. If you ever see the guide, pick it up because they are hard to find. Copies are available in the U.S. on Amazon starting at $16.11.